Childcare educators and providers are calling for a fairer distribution of a $300 million Federal Government grant. 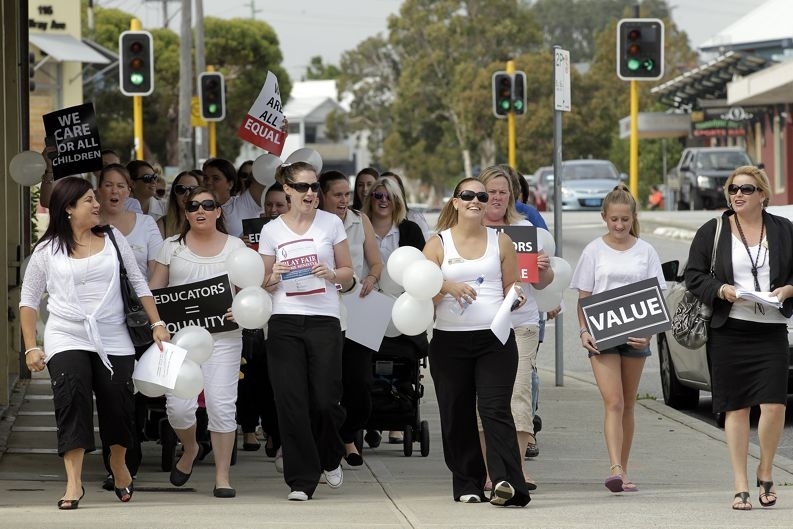 The rally, which ended at the office door of Fremantle MHR Melissa Parke, was organised because workers wanted the funding distributed equally to all early-years educators. The Australian Childcare Alliance said the grant, which boosts the wages of certificate qualified workers by up to $3 per hour and even more for diploma or degree-holders, was unfair. It said the money would ‘buffer’ the wages of a small section of the childcare workforce while a large majority of workers would receive nothing, and wants the funds distributed equally between all early-years educators. ACA president Gwynn Bridge said a better solution was a $1 an hour increase to everyone as opposed to as much as a $5 per hour increase to a select few. ‘We are demanding that the Prime Minister revisit this ill-thought initiative and distribute the grant equally amongst educators so that every worker gets $1 extra an hour,’ she said. Childcare Association of WA executive officer Rachelle Tucker said there were about 380 long day care services in Perth and that rally members were disappointed Ms Parke did not address them. ‘The first-in-first-served grant only supplements the wages for up to 40 per cent of all long day care centre educators, and we believe all educators are valuable and deserve a share,’ she said. Ms Parke said she supported better pay and conditions for early childhood educators. ‘Rallies are a legitimate way of expressing a point of view but if the people who attended my office on Monday had contacted me in advance we could easily have sat down for a conversation,’ she said. ‘The Government is making a $300 million investment as a first step in improving the pay and quality of early childhood education.